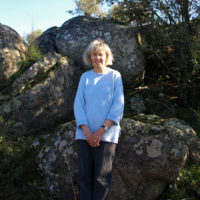 Gisela Radant Wood shrugs off the weather to walk part of Walk 21 from her guidebook The Sierras of Extremadura. It was 14 January and one of those days when we knew we wanted to get out into the fresh air and do a good walk. It had rained solidly the day before, confining everyone to time indoors. It was wonderful to see the countryside green and wet, but the mist that hung about a metre off the ground was not so exciting. 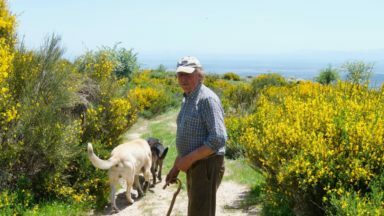 The usual stalwarts in the Almoharín walking group met in the village churrería (café, for want of a better translation). We discussed the possibility of a walk, or not, while consuming cups of hot coffee or chocolate and eating various toasts with tomatoes and olive oils, or the obligatory churros (thin doughnut sticks). Inevitably, it started raining again but we decided to go for it. We walked up to the square, piled into cars and drove north for 20 minutes in the hope of clearer weather. Not a chance. 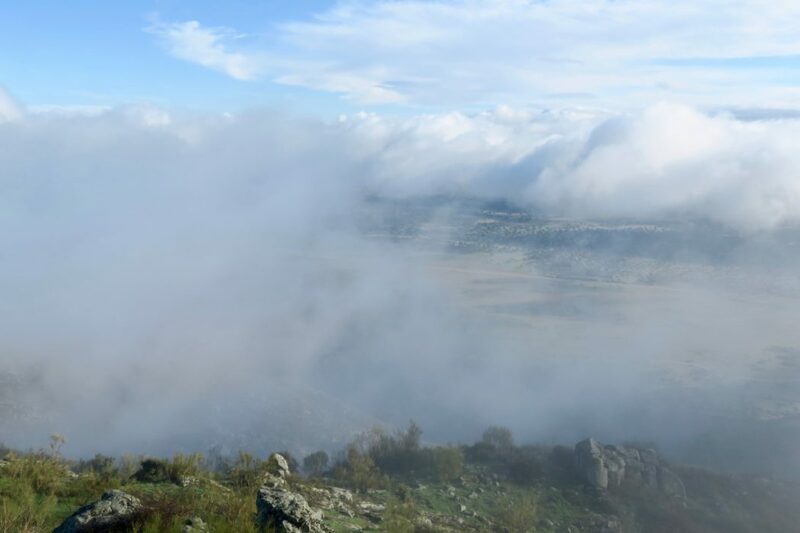 We parked in the square of Santa Cruz de la Sierra, a small village just off the A5, looked at the sierra ridge we intended to climb and saw… not a lot except for mist. At least it had stopped raining. 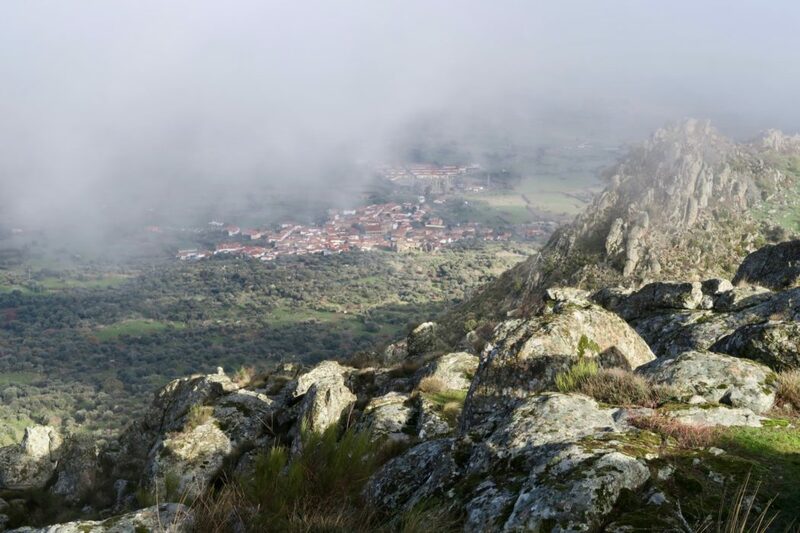 The Sierra de Santa Cruz is a landmark because it ascends above the surrounding plains rather like an ancient pyramid of granite. 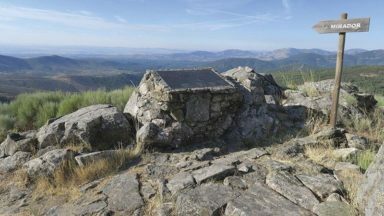 The summit is known as the Risco de San Gregorio and a Moorish cistern was excavated hundreds of years ago right on the top. From the summit there is an impressive ridge that runs along the top of the sierra giving views to both sides, east and west. Sunrise and sunset are fabulous from the vantage point of the summit, yet it is only just over 800m high. After quite a serious discussion of our options we decided to climb the summit by the ‘easy route’ rather than the more picturesque, but much more difficult, route from the south-west. 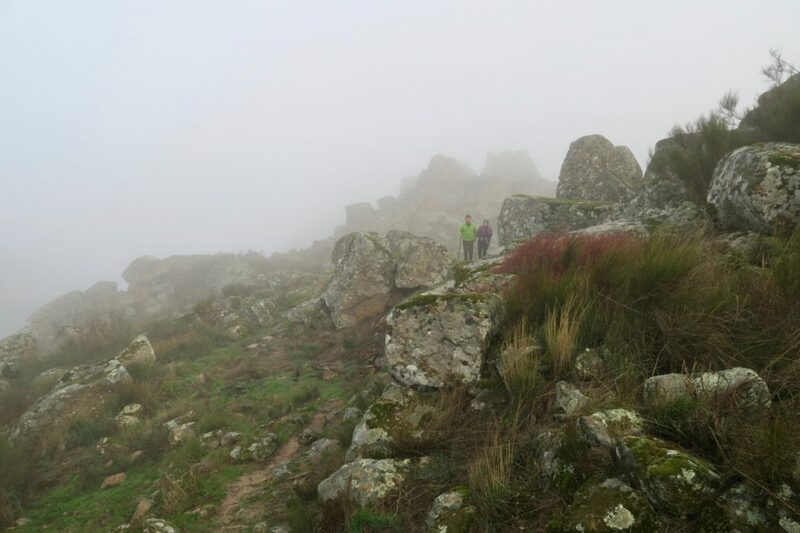 There wasn’t much point in going for the views or the scenery with the mist so low, and the wet would make the huge granite boulders we had to climb slippery. 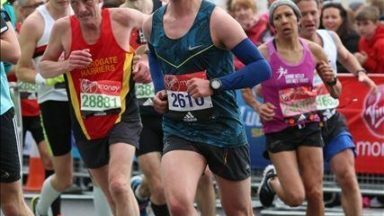 We all agreed it would be insane to tackle that route — in spite of our combined experience and familiarity with the terrain. 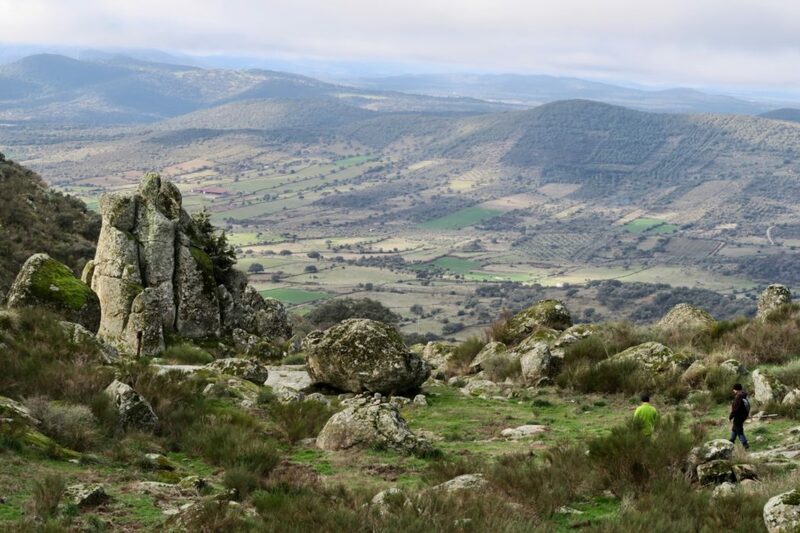 We left the village square and quickly came to the small track that took us on to the lower slopes of the sierra, which are covered in historical remains dating as far back as the Bronze Age. 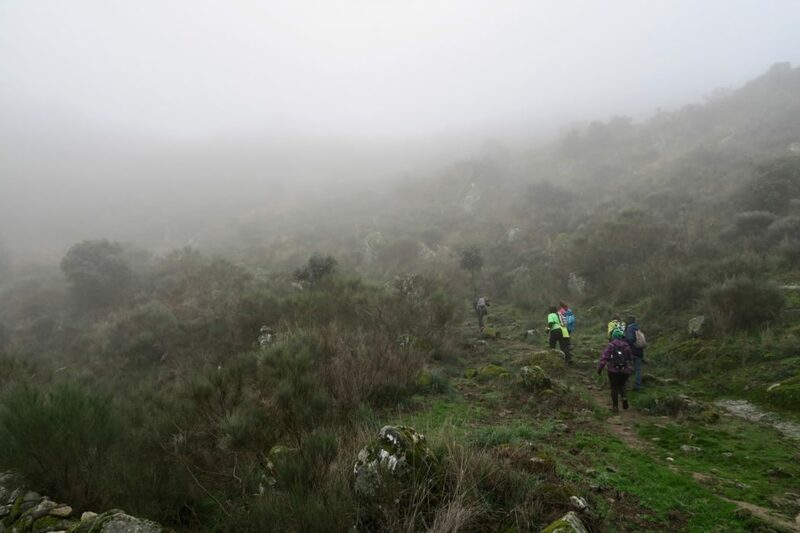 There are several footpaths that meander along the slopes but only one going up to the summit from the sierra side on which we had chosen to walk. 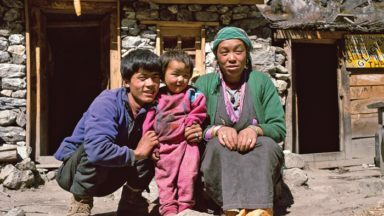 The vegetation consists of rough grazing and there are sheep and cows, even on the highest part of the mountain. There is a huge amount of white broom in spring, with low-growing trees on the lower slopes. 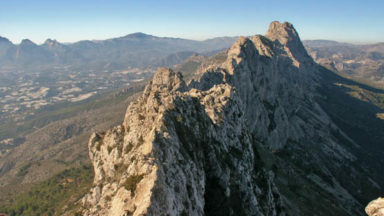 Along the summit ridge are almond trees, but apart from those the main natural feature is the rock. The whole sierra is peppered with huge granite outcrops and boulders strewn about as if a giant had casually spilled a jar of assorted-sized marbles in an absent-minded moment. As we ascended we tried to keep off the slippery granite paving slabs laid hundreds, if not thousands, of years ago. We walked on the soft earth, moss and grass between the slabs. There were a few slips and falls but nothing serious, thank goodness. 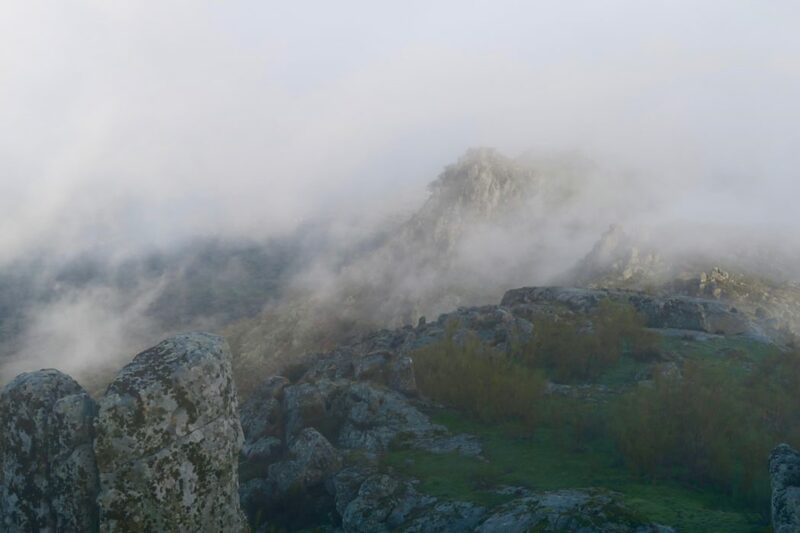 The looming mist kept the summit hidden from us but the overall atmosphere, in such a geologically structured place, was eerie but rather nice. We passed granite water channels, attributed to the Romans but probably medieval, and walked carefully around the muddy ground by the water troughs overflowing with water after the recent rains. 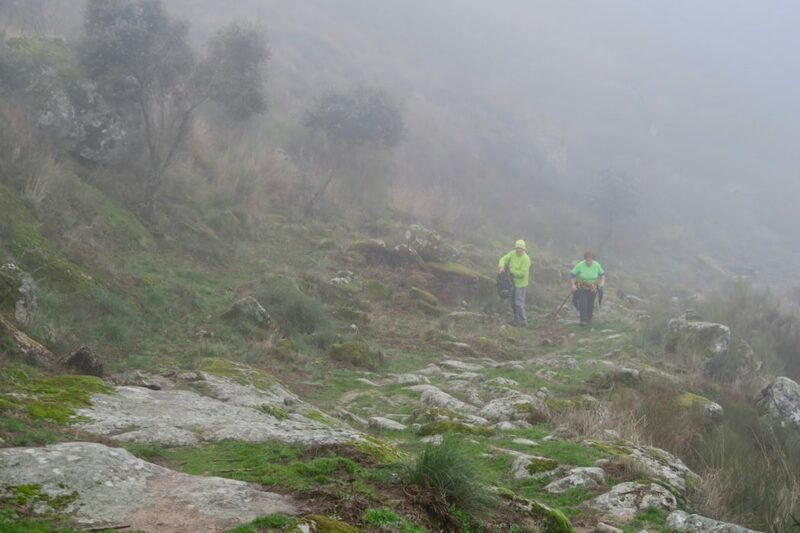 As we continued up we entered the part of the sierra where ancient peoples sited their necropolis and a little further on we came to hewn boulders with the name of Poblado del Saliente. 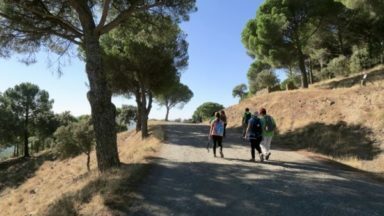 After that we picked our way carefully and steeply upwards to climb up to the Moorish cistern and to have a second breakfast on the top of the Risco de San Gregorio. From the summit we could see… not a lot. It was quite chilly and the mist kept swirling in waves. We were careful not to get too close to the cistern in case we slipped on the wet grass and ended up at the bottom of the thing. It’s quite big – about 6m by 3m and 4m deep. 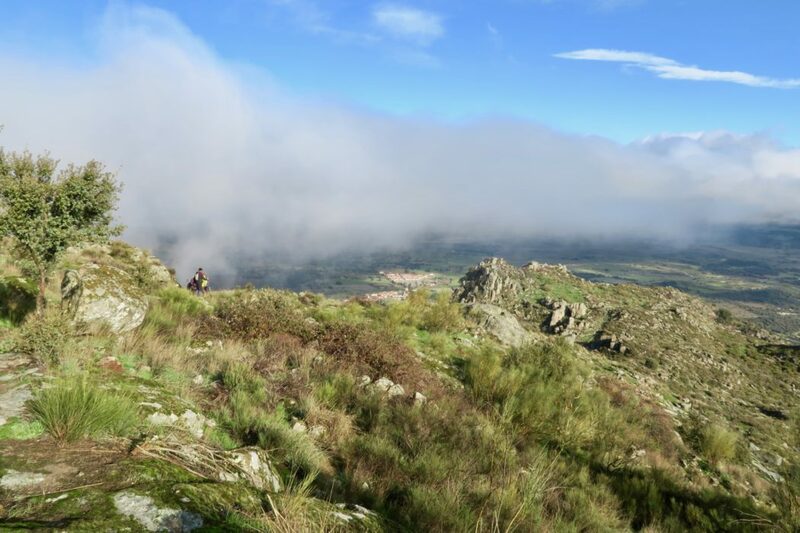 As we munched bananas, dried fruits and pure black chocolate the sun started to break through the mist and gave us occasional glimpses of the valley below. Although it was tempting to wait for the sun to clear the mist just a little bit more, we were getting cold and so started the descent. We went back the same way we had come up, which was not boring because the sun did come out more strongly, lifting the mist considerably. We were able to see the things that we missed on the way up and that was rather nice. Once back in the village square we stopped for beers and hot coffees in one of the bars and decided that the decision to walk today had been the right one — in spite of the unpromising start. We had had a good time and were not, after all, in the slightest bit wet — not even damp.